Cape Cod Hydrangea, Tell Us a Little About Yourself! Hey! Today, we're meeting up with Heather's latest scent, 'cape cod hydrangea for a scenterview! The Happy Lotus: Welcome to our latest scenterview with our newest scent, cape cod hydrangea! Tell us a little bit about yourself! Cape Cod Hydrangea: Well, I ... WHOA! What happened to you? I see you're in a boot ...and are those crutches nearby? THL: Oh, that! Yeah, I was playing basketball with my son and doing my best impersonation of Larry Bird's Fade-Away. We were actually just playing the game knockout and I landed on my ankle and rolled it, but the Larry Bird thing sounds waaaaaaay better. THL: I am, thankfully. I broke a bone beneath my ankle. Fortunately it's not weight bearing, so I've already been cleared to walk with weight on my foot and I don't need the crutches once I get stable enough on my own. CCH: Well, that's great! And I notice my initials are also the initials for Cape Cod Healthcare or Cape Cod Hospital ... that must have been done on purpose! THL: HA! No, but I see your spicy side is showing right now! CCH: You're right, you just never know what you're going to get with me! Getting back to your original question, I'm sweet with a hint of spice, showing off notes of lily, carnation, and orange. THL: Oooo, that's a good combo! Is it possible to smell both sides of you at the same time? CCH: Yes! Just when you think I'm spicy, I go sweet on ya, and just when you think you’ve had enough of the sweet, the spice just seems to kick back in... kinda like having kids, right? They're cute and adorable, but you never quite know what's inside those little heads of theirs! THL: I love hearing what kids have to say - the way they think is *so* different from adults! So, what's your favorite room to be in? CCH: The bedroom or the living room for sure! My spicy-yet-sweet scent is noticed walking towards any room I'm placed in, almost drawing you toward me. But I'm pleasant to be around, too, complimenting any space that I'm placed. THL: Does the orange essential oil overpower you? Or the floral side of you? CCH: No. The spicy orange does a wonderful job of taming the sweet florals, and I really am a well-rounded fragrance. THL: So, what's with your name? Anything special about you or your history you want to share? CCH: Sure! I was one of the first scents ever made by Heather! Back in the beginning when she was experimenting with dying candles, I was dyed light purple. But she couldn't come up with a name for me. "Gum drop" and "sugar, meet spice" were a few names that were tossed around, but nothing really jumped out. I might have some spice to me, but I'm also sweet, so I patiently waited for her to find the right name. After all, one of the things Heather loves is coming up with her whimsical names for candles. 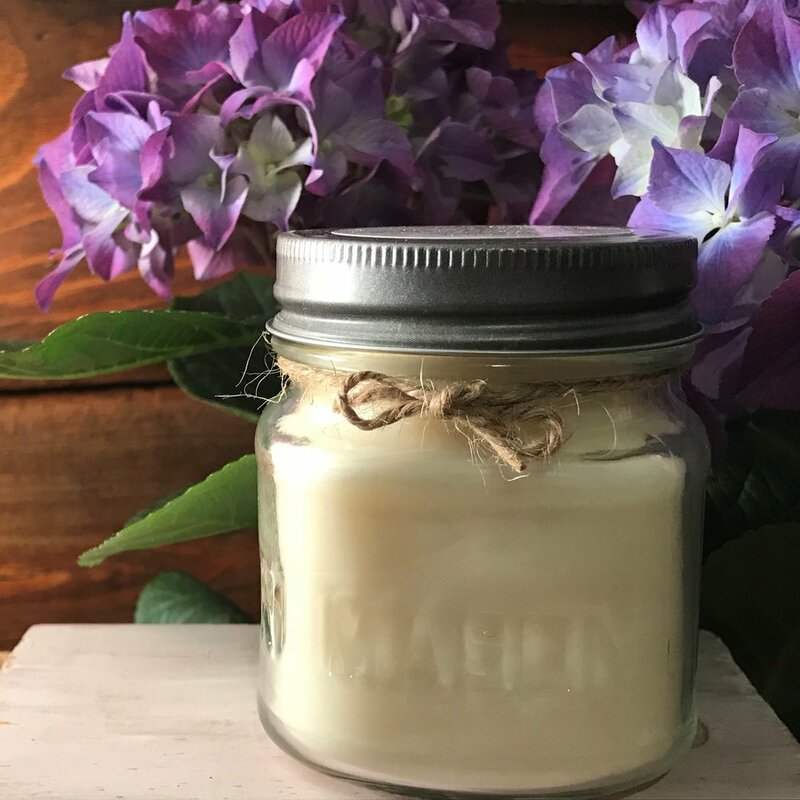 She came across my scent again, and thought of those beautiful Nikko blue hydrangeas that is one of the many things Cape Cod is known for, and she was sold! THL: Well, thanks for stopping by and talking to us! Have a great rest of your May Day! CCH: You too, sweetie. You take care of that ankle, ok? Rest and elevate ... after all, those beach days will be here before you know it!